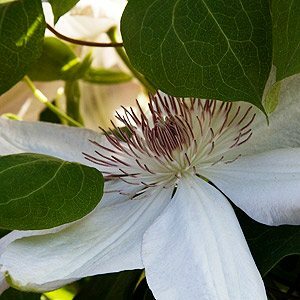 With clean crisp white flowers Clematis Henryii is one of the best of white flowering species. Large flowers to 7cm across with an attractive rib on each petal. Heavy flowering through summer, the brilliant white of the flowers with brown anthers stands out well against the mid to dark green foliage. New foliage is a bronze green which quickly turns to green in spring. One of the great things about Clematis Henryii is that it flowers almost continually through the season. A cool moist shaded root run with the plant in a position where it can grow into the sun or light shade. A position where support is available, a climbing frame, fence or pergola. Clematis Henryii flowers on both new and old wood. Pruning is best carried out in late winter to spring. Remove completely any weak stems. Prune the rest of the plant back by 1/3 to strong buds higher up. Train new growth so that it spreads across the trellis or growing frame. This pruning regime may see m a little harsh, however it will produce the best looking plant and the most flowers.